This is one of the great victories of global trade disputes that needs to be celebrated and commemorated. It is a victory made sweeter still because of the David and Goliath nature of the battle in which David has walked away with all the honours. Such triumphs are rare. So when an international arbitral tribunal ruled in early July in favour of Uruguay against tobacco giant Philip Morris, there was cause for much cheer. This is extremely significant not just for the small South American nation, but for all countries that have been taken to arbitration by corporations that have always put their profits ahead of the wellbeing of people. The case was filed in 2010 by Philip Morris against two regulations passed by Uruguay to protect public health against tobacco-related diseases by preventing the false advertising of tobacco products. Philip Morris used a bilateral investment treaty (BIT) to challenge these regulations by using a treaty signed between Uruguay and Switzerland where the company’s international arm is headquartered. BITs are lethal agreements that allow corporations to overturn policies and rules passed by sovereign governments by claiming that their investments have been jeopardised by such regulations. Multinationals have been cynically using BITs to stop countries from taking reasonable measures to protect public health, environment and ensure equity (see `Investment terror', Down To Earth, 16-31 January, 2012). 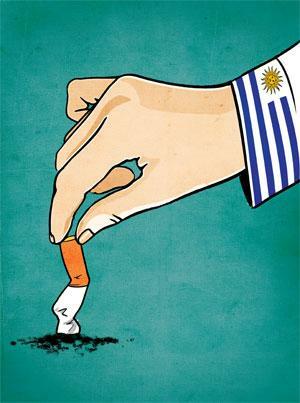 All that Uruguay did was to protect public health against tobacco-related deaths by prohibiting tobacco firms from marketing cigarettes in ways that falsely depicted some as being less harmful than others. Its laws also required them to cover 80 per cent of their packs with graphic warnings on smoking’s ill-effects. Philip Morris sought huge damages for infringement of its intellectual property (IP) rights by claiming that the impugned regulations had expropriated its IP without compensation. It also charged that Uruguay had failed to treat its investment fairly and equitably and impaired its investment. As the first case of a BITs claim against tobacco regulations (see `Unholy smoke! ', Down To Earth, 16-28 February, 2011), it caught the attention of the world. When Philip Morris filed its lawsuit at the World Bank’s International Centre for Settlement of Investment Disputes (ICSID), it was felt the tiny country would be overwhelmed by the need for specialised attorneys and the costs since such proceedings entail huge expenditure. Remember that Philip Morris is the world’s biggest tobacco company and enjoys revenues of more than US $80 billion, while Uruguay’s gross domestic product is around US $50 billion. Fortunately for Uruguay, the then New York City Mayor Michael Bloomberg came to its rescue by agreeing to pick up most of the tab for its legal fight. For the Lilliputian country there was sweet balm in the ICSID panel ordering Philip Morris in an unprecedented move to pay Uruguay’s fees and other costs—a sum that exceeds US $7 million. Even if other countries do not have a white knight to rescue them, the award has shown that any country can, and should stand up to Big Tobacco. Already, the UK, Australia, and Norway have won the right to insist on plain packaging of cigarettes. Lawyers who were involved in Uruguay’s defence believe that the ICSID ruling will embolden others to adopt tougher laws to regulate the marketing and distribution of cigarettes and other tobacco products. Most significantly, the ICSID decision affirms the sovereign rights of countries to adopt laws that are in their citizens’ best interests. Now that the arbitrators have ruled unequivocally on such laws, will India stop dithering on its plain packaging laws which have been in limbo for years? If the Modi government is laying down the law on what people can or cannot eat, surely it can decree what should not be smoked? Or at least warn us about the consequences?